Hello, and welcome back to our blog here at Computer Tutor Business And Technical Institute. This is part two of our blog series about eight reasons why you should choose a technical college. 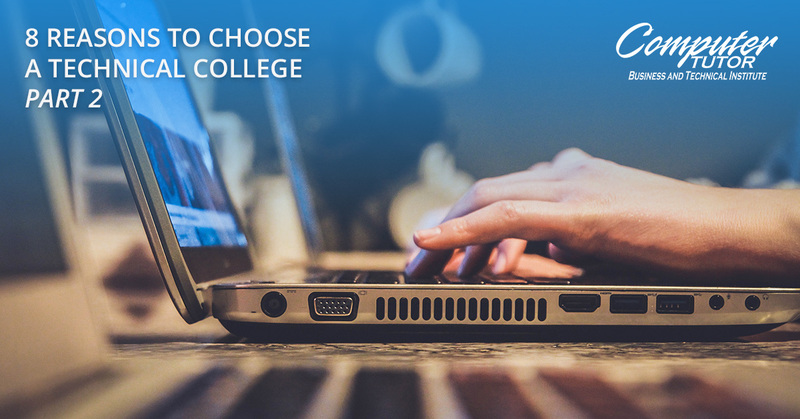 Although these programs are certainly not for everyone, it’s important to take all things into consideration when planning out your education and future career. In our last blog, we talked about the high employment rates for those who receive a certificate from a technical college as well as the hands-on approach that educators take in this type of university. If you would like to learn more about how this works, visit Computer Tutor Business and Technical Institute today. Our program is designed to create a laser-focused education plan for you that will get you into a great career as quickly as possible. According to Reuters, only about 56 percent of students who pursue a bachelor’s degree will finish within six years. But due to receiving a technical certificate in half the time and at a significantly lower price, many more students are graduating from technical universities. It’s kind of disheartening to think that such a large portion of students who start a four-year program either never finish or they’re so busy working and taking classes on the side that they aren’t able to finish within six years. And even after that, they find that they’ll need to pursue a masters to actually get offered the jobs they want to be working. One of the great things about technical colleges is that many of them have important connections to specific companies within the industries they operate. This is in contrast to four-year colleges where there are so many career paths associated with each degree that it will be difficult for a professor to direct you to any company in particular that will have a high chance of hiring you. On top of that, many students at a four-year college have experimented with different focuses all throughout their college career and it won’t be immediately obvious to employers how you’ve set yourself apart in your education. In other words, an employer will see your technical college certificate and know exactly the kind of experience you have, whereas with a traditional university degree, it’s difficult to know exactly what experience you have without you actually telling them. This explains why so many people who receive a technical certificate end up going immediately into their industry of focus after completing their education. One major turnoff for students looking to pursue a technical certificate is that they believe there will be a lack of options available to them or that they’ll be forced to choose their career path too early. However, this isn’t necessarily the case. At a four-year university, many students are left undecided on their major for several years before actually deciding what they want to do with their education. This isn’t exactly ideal for someone who wants to be locking down a solid career within a couple years time. However, in a technical college, you’ll be working towards a specific career from the beginning and professors will help guide you into a career based on your personality, strengths, and weaknesses. Another mistake people make when deciding between a traditional and technical college is that they assume once they get a career, they won’t be able to branch out and try new things because their certificate is too focused. This is also not always the case considering experience is what most employers are looking for when they’re hiring employees. If you’re able to get a lot of experience in one field of work, you’ll have an easier time branching out and trying new things as you see fit. Are you ready to experience the benefits of enrolling and completing your education at a career college? Established in 1986 in Modesto, California, we are a great education option for those looking for careers as an administrative medical clerk, administrative accounting clerk, administrative assistant, office clerk, sterile processing technician, medical office administration, or veterinary assistant. Contact us today if you have any questions for us.